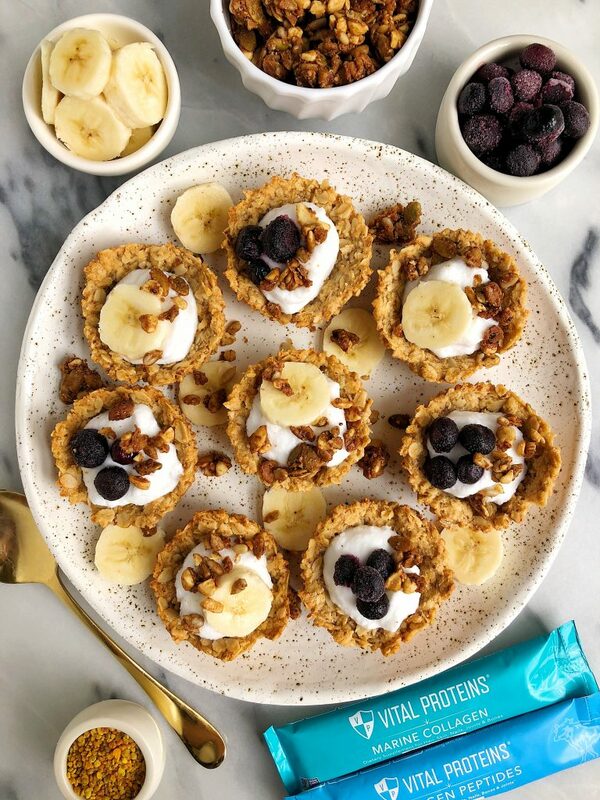 Mini Gluten-free Collagen Granola Bowls for a quick and easy breakfast recipe and they are egg-free, dairy-free and filled with collagen peptides! Friends, I have your new favorite breakfast recipe right HERE. 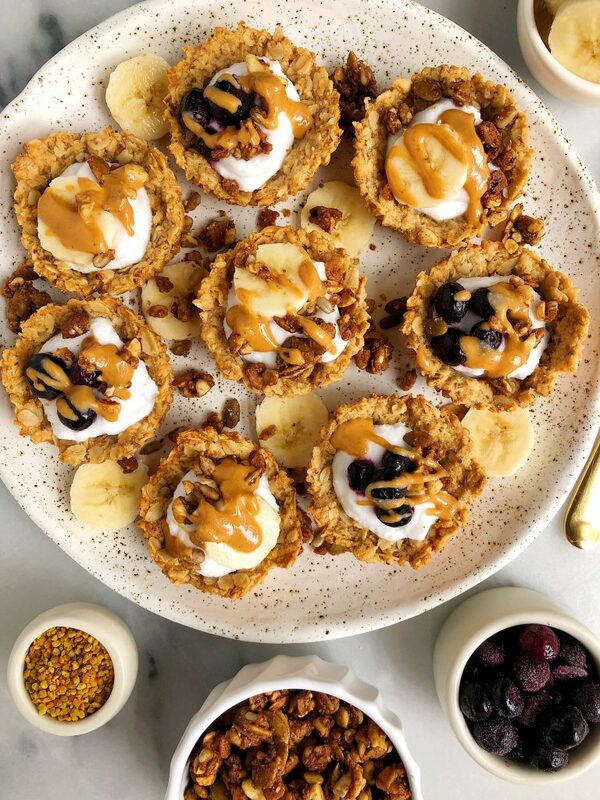 These Mini Gluten-free Collagen Granola Bowls are not only the most adorable (yes I’m not describing food as adorable) breakfast but they are also so simple and easy to make and eat on the run. One of your biggest requests is more “on-the-go” eats for breakfast and I gotchu covered boo. Make a batch of these on a Sunday or any day after work and you can eat them for breakfast for a few days. Usually I eat 3 at a time, but depends on the amount of toppings and things I toss in there. These granola cups are super versatile and you can pretty much add anything you want in them. I love doing yogurt, fruit, granola, nut butter, anything! But I do recommend adding the toppings in before eating in the morning so the bowl doesn’t get soft. 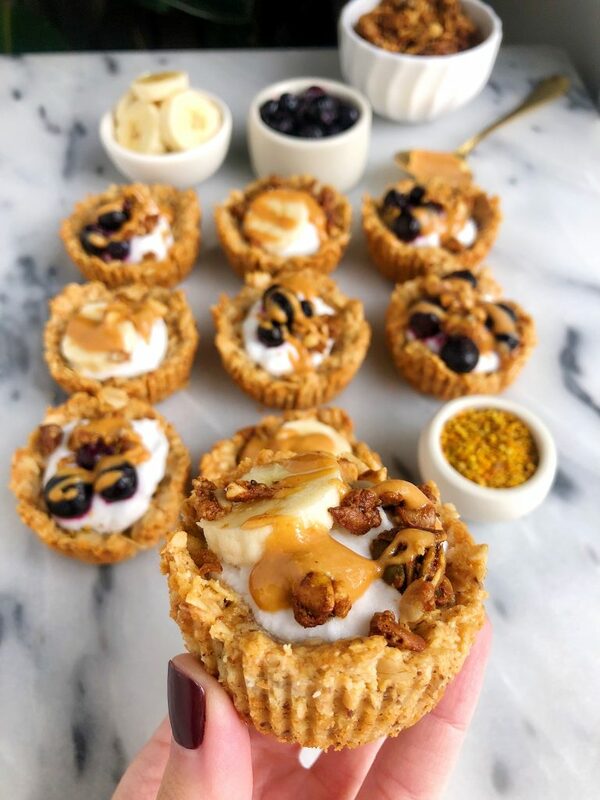 These Mini Collagen Granola Bowls have an oatmeal and almond flour crust and I also added in some Vital Proteins Collagen Peptides for extra protein and a nutritional boost (more on collagen here!). You don’t even taste it, which I love so it isn’t overpowering, more just a little something extra for us to add to the mix. This recipe is also gluten-free, dairy-free and egg-free (very allergy friendly!). If you are allergic to nuts, free free to use oat flour instead of the almond flour too (do not sub coconut flour please!). I cannot wait to see what you guys add into these granola bowls and hear what you think. Share with me over on Instagram 🙂 And if you’re craving some more yummy recipes that use Vital Proteins, here are a few of my favorites: 4-ingredient Blueberry Collagen Jam, Doughy Chocolate Chip Cookie Pizza and Paleo Pumpkin Chocolate Chunk Cookie Cake. I love adding coconut yogurt, fruit, granola and nut butter! Bowls will stay good in the fridge for 5 days. You can freeze them for 2 months as long as there are no toppings on them! Thank you Vital Proteins for sponsoring this post! It means so much to me to partner with brands I love and believe in! This is such a fun idea, and I love how you can switch up the toppings based on what you’re craving that day!